Another very special cookie recipe for my Christmas cookies selection this year, are the Dycio Crescents. These might look like a lot of work, forming crescents from cookie dough, but soon you will find out how simple these actually are. I also would like to share with you a special story about this recipe. I met a very sweet lady in my church, who made these crescents for a church function. I loved them so much, and asked her if she would like to share her recipe with me. Of course, as kind as she is, she graciously agreed, but told me that she did not have a written recipe, as she always makes these from memory (you will identify with this if you ever asked your grandma for any recipe). So the next time I saw her, she brought in a meticulously hand written (in Ukrainian) recipe for Rohalyky (crescents), and in addition, offered many helpful tips to make sure I understood her written instructions. I think this created a mutual satisfaction, so I decided to share this recipe with you, as I am sure you will not find it anywhere else. These crescents are not very sweet, but light and flaky in texture, and the jam centers make them that much more delightful. You need to remember to only use special jam for baking, as the regular jams are not suitable, and will boil out during baking, making a mess out of your cookie sheets, plus leaving a hallow center in your crescents. I use Baker Fine Dessert Filling in Apricot flavor, or Solo Cake and Pastry Filling. I also use these fillings for my very favorite Apricot Sheet Cake. This recipe yields at least 5 dozen of crescents. In a mixing bowl combine butter, sugar, eggs yolks, salt, and extract. Mix the flour with baking powder and gradually add into the mixture, and continue mixing, until well incorporated. Divide the dough into 8 even balls, each the size of an orange. Place in a bowl, cover, and keep refrigerated for a couple of hours, or overnight. Take one dough ball at a time, and massage it by squishing it with your hands for 10 seconds, to soften it. Flatten slightly, and place it on a floured work area. Roll the ball into a large, 1/8 inch thick circle, like for pie crust. Using a pizza cutter, cut it into 8 even triangles (like pizza). Place 1/2 tsp of filling in the middle of the wide end of each triangle. Roll the wide end over the filling, and keep on rolling all the way to the triangle point. Slightly beat the egg whites, but not too much as not to get them frothy. Fill a place with granulated sugar. Dip the crescents (still in a straight form), in the egg wash, then roll them in the granulated sugar. Place them on a well greased cookie sheet, with the tip end at the bottom against the cookie sheet. Bent the ends of each roll, to form crescents. Bake in a preheated oven, at 350°, for 20 minutes, or until the edges start getting golden. Remove onto a cookie cooling racks, and cool completely. I also use Almond filling, by Baker or Solo, for these crescents, which also tastes wonderful, and adds a nice variety to my cookie selection. I enjoyed your story about how you came across this recipe. Just like asking my grandmother for a recipe, all in the memory. As I don’t care for treats that are too sweet, this sounds perfect and I cant wait to try them. I am very happy to know that you can relate to my experience. There are so many great cooks out there who do not have recipes, and they have to go to such great lengths to create one, in order to share it. Actually, I just saw this lady again this past Sunday, and informed her that I posted her recipe on my website….she was elated, and I felt so good to see her face light up with a smile. I hope you don’t mind to translate this in my blog. Will provide a backlink. I will be happy to share this recipe with you, in a translated version on your blog, with a link to mine. Please notify me of your post. 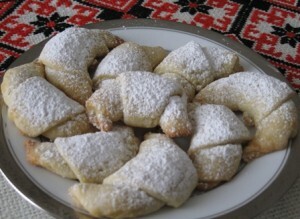 I just finished cooking and eating these Rohalyky, sooooo yummy! It was a fun recipe to make, I even had my 3 year old daughter help me make them, very cute! I used plum jam for the filling, It tasted lovely too! Thanks again for another great recipe, I will be collecting this recipe as well as your other Ukrainian recipes to keep a record for myself of Ukrainian recipes for me to pass on to my kids. Thanks & I look forward to more of your posts in the future. It is a pleasure to hear that you had fun making the Rohalyky, and enjoyed them. My granddaughter is 3 years old, and she loves to help around the kitchen. You can freeze these as well, if you have any left over. My son is suggesting that I print a small cookbook with my current collection of posted recipes, but I am not sure my time allows for this project at this time. Maybe at some point later on. What do you think? You should definitely produce a book in the future, your recipes are really user friendly and yumo. I am sure a lot of your followers would love that. Great idea! Sounds like you have one happy growing family, and you still want to cook and bake from scratch…you are amazing. I will keep in mind the cookbook idea. Thank you. Yep I totally love to cook, everything homemade always tastes better don’t you think! Do you recommend rounding up or down when converting to grams? For example from the great links to convert 16 oz Butter or Cream cheese equal 453.59 grams, I think I rounded down to use 450 grams of each. Your husband is a very lucky man. Not too many young mothers want to cook much from scratch. Yes, I agree, homemade food is much better for us, since it is not over seasoned, and without any additional preservatives. Rounding off grams would depend what the ingredient is. Butter, cheese, sugar you can play with either way, but yeast, flour and liquids should be more precise. You do not have access to American measuring cups and spoons ? You are correct a lot of young mums don’t cook, but I LOVE IT!!! I have always loved cooking for friends and family and love trying new recipes, I know cooking takes time but I try and find time when my little baby sleeps in the day and I get my 3 year old to do little jobs in the kitchen with me, so it’s fun for us both. Yes my husband is very lucky for sure but he is a great cook too, I work a few days a week in an office job and the rest of the week I am mum/chef and love my work life balance. Sorry just checking that I correctly cooked these, so I can whip them up again next time. I should add the cream cheese with butter, eggs yolks, salt and extract and no sugar in step 1 and add the 1/2 cup of sugar only in the step 14? Is this correct? I have used caster sugar, we have white sugar too, which do you prefer? Oh, that is great. You have a wonderful family. The 1/2 cup of sugar I used in the dough preparation, and then I used additional sugar to dip the crescents in, and do not have the exact measure for it since you use as much as you need. I use the granulated sugar, since that is our regular sugar in the stores. Caster sugar, as I understand it, is much finer, but I don’t think I ever came across it at my grocers. I think using caster sugar in baking is fine.